Posted on 01/01/2014 by Jayson	in Markets Comments, Trading Thoughts and tagged Biosensors, CapitaMall Trust, CDL, Ezion Holding, M1, STI, stock picks 2013, stock picks 2014, TDSR, technical analysis, Thoughts. 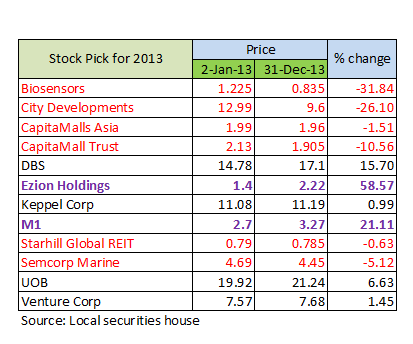 Before we move on to 2014 stock picks, let’s look at the performance of those stocks which were selected by a local research/trading house for the year of 2013. Of the 12 recommended counters, 6 were negative and the rest were positive. Of the negative counters, Biosensors, CDL and CapitaMall Trust were the hardest hit. They ranges -10.56 to -31.84. Of the positive counters, the star performers of the year include Ezion Holding (+58.57%) and M1 (+21.11%). For me, I would deem the stock picks by local research houses as fundamentally good stocks as at the beginning of the year and it is important to apply technical analysis to these counters to avoid pitfalls and maximise profit. People always ask about recommended stocks to buy for STI, but they forget about timing. The local houses have spent so much resources and research on these counters and have put across their choices, with their reputation at stake. I am sure there must be strong basis on their selection. Fundamentals considerations comprise of expected earning, intrinsic value, potential upside etc. But these criteria are dynamic and no one can guarantee that the expected earning would not change. For example, no one would expect earnings of CDL or other property related stocks would be so badly affected until the implementation of TDSR by MAS in the middle of 2013. Property counters, including REITs were hit. Apply technical analysis will allow one to get away early before the counters took a deep dive. It also reinforces the idea of applying both fundamental (taken care of by the analysts) and technical analysis when one trades, be it long or short term. 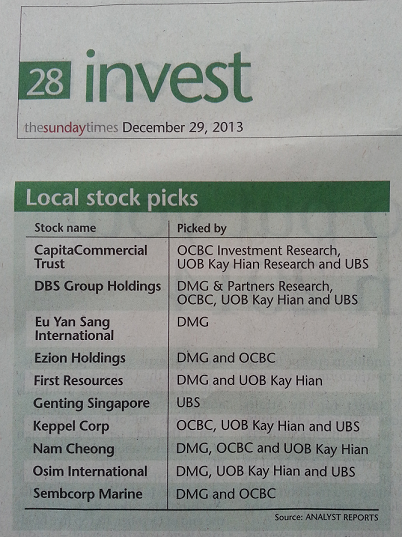 The stock picks for 2014 was published by the Sunday Times on 29 Dec 2013. I want to document it for review on 31 Dec 2014. This will also be useful for readers who want to have some reference at any point of the year. Again, I need to caution on investing in these counters blindly or simply ‘buy and hold’. I have illustrated earlier that, if based solely on fundamentals, the probability of getting the counters correct is only 50-50. Last but not least, I wish everyone good health and a prosperous 2014.